​Hack is back, for better or for worse. ​Christian Hackenberg's debut in the AAF has gone about as well as his career in the ​NFL went: terribly. 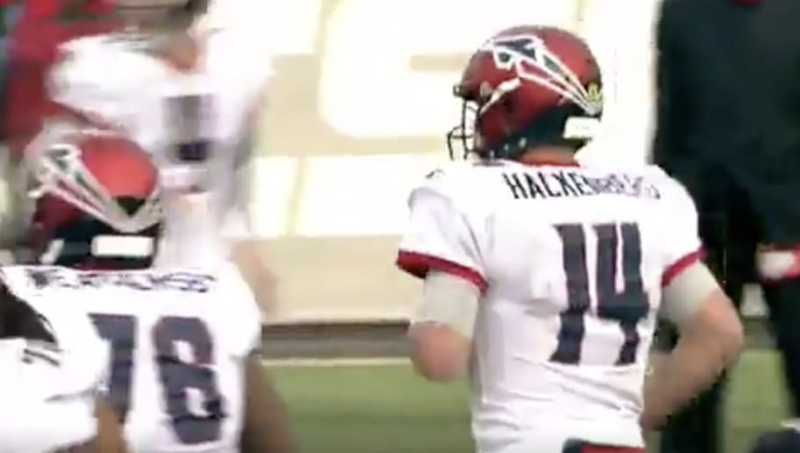 The former ​New York Jets quarterback has struggled in the first half of his start for the Memphis Express, and after throwing an incomplete pass on 3rd & 9, Hackenberg lost his cool and let out some NSFW words for the viewers. Hackenberg has not had it easy in this game and he's clearly getting frustrated, storming off the field after his errant pass. Unfortunately, the camera picked up the sound of him dropping some F-bombs on his way, followed by a very loud "God Damnit!" for which the commentators were quick to apologize for. The New York Jets selected Hackenberg in the second round of the 2016 NFL Draft. The former Penn State standout failed to develop on the Jets, and as a result is now suiting up in the ​AAF. Christian Hackenberg is a starting professional quarterback. Hackenberg failed to log even a single snap in the NFL but he's getting the chance to turn his career around in the AAF. He'll need to rebound in a big way on Sunday to turn his comeback story around and get off to a positive new beginning.